This retreat at 345 Surfsong offers plenty of living space amid a tropical decor. The kitchen is stocked with essentials for your stay and is spotless, efficient and very accommodating - perfect for those that prefer to cook while vacationing. The living room provides plenty of seating, including a sofa bed, 50 inch flat panel television, as well as a dining table that can seat up four. Step outside into the outdoor balcony and relax while enjoying a side view of the gulf waters. In the master bedroom, you will find a king sized bed, complete with a 32 inch flat panel television. Linen for all beds, extra pillows & sufficient towels for your stay are always provided. Weekly maid service is provided with this unit. One of the most popular attractions this area offers, after the beach and swimming of course, is John's Pass Village. Located directly across the street, The "Pass" is a quaint turn-of-the-century fishing village and Pinellas County's #1 tourist attraction. The Village has over one hundred unique shops, a variety of restaurants, the local fishing fleet, dolphin watching and shelling tours, boat rentals, parasailing and jet skiing. Best of all as a SunHost customer you can walk to this great entertainment destination. Absolutely love it here! Everyone here is welcoming and friendly. Can’t wait to come back again. We absolutely LOVE visiting Surf Song for our vacations! It's so charming and comfortable being here. 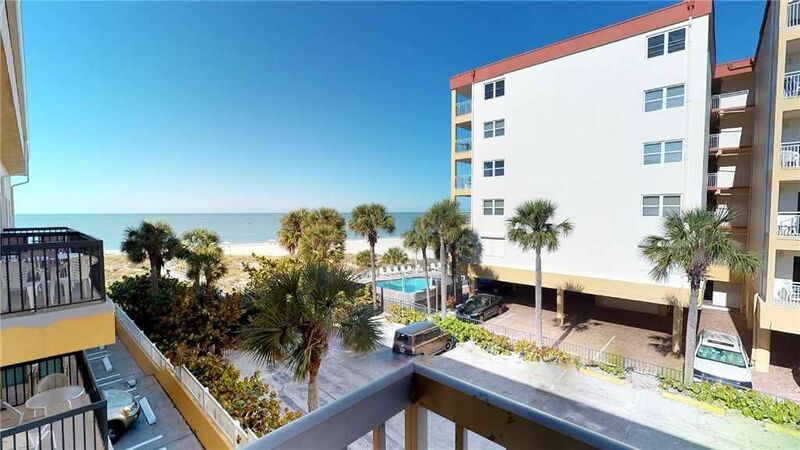 This resort has it all -- it's right on the beach, has a pool, great condos, friendly staff -- and John's Pass directly across the street which has wonderful restaurants and great shopping! We stayed in unit #345 this trip and enjoyed it very much. It's furnished beautifully and had everything we needed. We'd stay in this unit again!